A public vote designed to celebrate local businesses in one city backfired - after Nando's and Wetherspoon took top prizes. But residents in the Lancashire city made their feelings known - plumping for the two national chains in favour of the homegrown competition. A local restaurateur said it "doesn't show Preston in a great light". 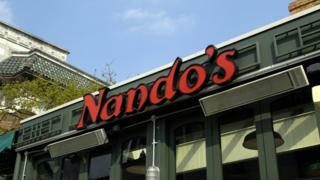 Peri-Peri chicken chain Nando's was hot favourite in the restaurant of the year category, while pub of the year was won by JD Wetherspoon outpost the Twelve Tellers. Mark O'Rourke, who owns a group of local eateries, said it wasn't fair to put local independents up against national chains. "Wherever you go in the country and go into a Wetherspoon's or a Nando's, it's the same as the last one you went into," he said. Mr O'Rourke, who runs We Don't Give A Fork, Fino Tapas and the Otter's Pocket in the city centre, was awarded multiple retailer of the year. However, he said his complaints were "not about me winning more awards" but about giving local businesses a chance. Others agreed with Mr O'Rourke. James Burns wrote that it was "pretty hard" to defend Preston in light of the results. While Chris Eyles-Chaloner likened the vote to the Boaty McBoatface episode - where a comedy suggestion won a competition to name a polar research vessel. He said almost 68,000 votes were cast by the public, and "they alone determine their favourite clubs, bars, stores, pubs and restaurants". Nearly 50% of the awards were presented to the independent sector, he said, adding: "It only goes to show that the independent sector can hold their own against the national brands." Wetherspoon spokesman Eddie Gershon said The Twelve Tellers was "a superb pub". He added: "It is very much a local business, providing employment to many people and although it is part of Wetherspoon, it has its own identity and is very much a one off pub in terms of design."